← ….. Buddleia & Butterfly …..
…. to Ginny, the Collie Dog in this painting, who sadly passed away last week, aged around 19 …..
….. Ginny belonged to Gilbert & Sons, who have been a tremendous support to me and my artwork over the last year ….. 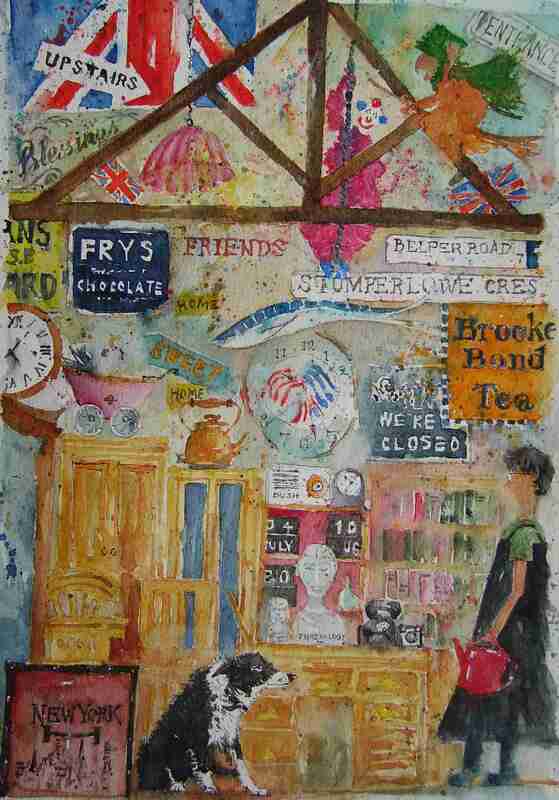 This entry was posted in Art, Books, Dogs, Sheffield, Sheffield - watercolours and tagged Antiques, Furniture, Gilbert, Hunters Bar, Makers, Oak, Pine, S11, Sharrow Vale, Sheffield, Sons, Warehouse, Workshop. Bookmark the permalink. 10 Responses to ….. a Witch, a Clown, ….. and a Dedication …..
A good age for a dog! Sounds like Ginny was a treasure. I especially like the way you drew Ginny’s fur. The kettle is a favourite! wonderful elements building on top of each other ~ wonderful colors! colossal artist !